My name is Jennifer Moore and I'm a certified art teacher. 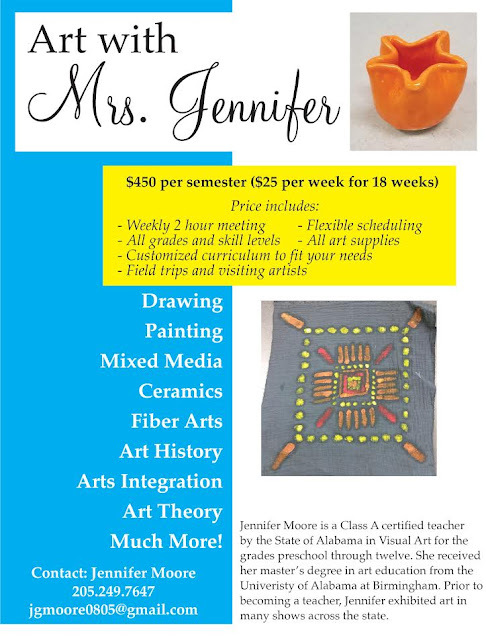 I would like to offer my art class to homeschoolers. I live in Gardendale but I am willing to travel. I have a lot of flexibility in ages, skill levels, location, times, etc. so I feel like I could really work with the students and parents to accomplish what they are looking for. I know parents homeschool for a variety of reasons and would work closely with parents on developing the right curriculum to accomplish their goals. If you have any questions, feel free to contact me. I look forward to hearing from you!